A new salmon recipe that is bursting with flavor! Do you constantly overcook your salmon? 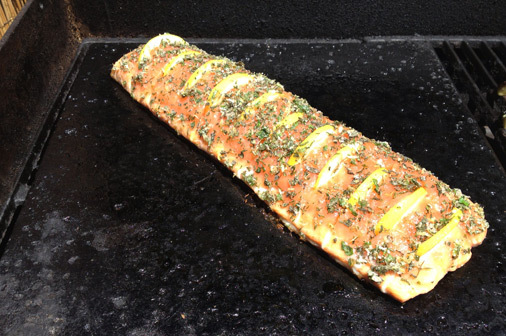 The Island Grillstone™ makes it almost impossible to barbecue a dry salmon. No tinfoil required. Preheat the grill to about 350 F.
Score the fish 1 inch apart as seen in the video. For making fresh herb seasoning salt, clean and finely chop the herbs together. Add salt and lemon zest to it and mix it well. Insert one lemon slice into the scored areas of the fillets, as seen in the video. Drizzle olive oil over the salmon. Sprinkle some fresh herbs over the fish. Set it aside. Repeat the same with the eggplants. Grease the grill evenly with oil. Place the eggplants and salmon over the grill as shown in the video. Cook them covered. Turn the eggplants midway to get grill marks all over. Pull the eggplants when it is al dente, almost after 6 minutes. Let the salmon cook a little further. Pull it out when done. Place the salmon on a bed of lettuce leaves. Serve it with grilled eggplants.